A trifle pricey, but the image quality and dramatic effect of gaming at 21:9 almost makes it worth it. 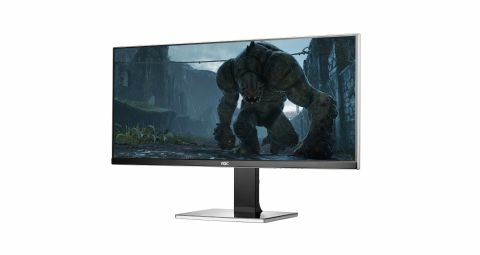 The AOC U3477Pqu is easily the most dramatic thing I’ve had on my desk since we held open auditions for this year’s PC Gamer pantomime. That eyeball-filling 21:9 aspect ratio has made me entirely forget about 4K gaming and look disappointingly on the RoG Swift which normally has pride of place. The panel itself is absolutely gorgeous straight out of the box. AOC have been going through a renaissance of Matthew McConaughey-esque proportions recently. Traditionally they've struggled to match up to their Philips rivals, but sported a lower price point to match their performance. The latest AOC monitors I’ve been testing though have been really impressive, both in terms of their image and overall build qualities. I loved the $550 / £400 AOC U2868Pqu for its 3840 x 2160 native 4K resolution and the fact it happily ran its impressive 28-inch TN panel at 60Hz the entire time too. The chassis was basic, but still well put together and was a full tilt/swivel design and had all the inputs you could need. Bargain. The $800 / £600 AOC U3477Pqu is rather more expensive, but I’d be far happier using this screen full time than any 4K screen I’ve used to date. Even the freaky-expensive 32-inch Asus IGZO panel. For a start that 21:9 aspect ratio really works in this 34-inch format, mostly because the 3440 x 1440 native resolution offers a third more desktop height than the 29-inch panels I’ve previously used. That means it offers a great experience just when you’re working in Windows, but the real kicker is how good it makes your games look and how much more immersive they suddenly feel. Now, I’m not talking Rift levels of immersion here, but sat at your desk the expanse of monitor really fills your field of view far more than a traditional 16:9 panel. And that panel is glorious too. It’s a lovely IPS screen, with all the colour reproduction, crispness and viewing angles you could want. My only slight issue with the screen is that the black levels are ever-so-slightly crushed at the low end, but some little gamma tweaks in your GPU control panel will sort that out. Other than that the white levels, contrast and gradients are spot on. The only thing I could possibly want over and above this is for AOC to work out how to get a 144Hz refresh rate and G-Sync into an IPS panel. Thankfully the U3477Pqu came out of the box looking good so I didn’t need to mess with the controls. AOC have nailed the build. It’s got a very minimal bezel around the outside and the controls are easily accessible, but overall there’s nothing standing between you and the screen. It’s a classic AOC on-screen display, admittedly, which isn’t so great, but thankfully the U3477Pqu came out of the box looking good so I didn’t need to mess with the controls. If you want to get a crick in your neck the tilt/swivel stand will allow you to work in a glorious portrait mode. There is one big problem. If you spend any time watching streamed video of any kind on your PC you’re likely to be rather disappointed. Most online video, even if it looks like a 21:9 video, comes with the top and bottom black bars hard-coded into the stream. That means you end up with a huge black border all the way around your video. Blu-Rays, and any legitimate 21:9 content, look stunning though. I’ve played the HD trailer for Interstellar so many times now, mostly for my own edification, but often just to show people how good it looks. There is a slight issue with game support too. Not a lot of devs are coding 21:9 support into their titles—there simply isn’t the install base there yet—which again leaves you with black bars at the sides. Thankfully there is an excellent application called Flawless Widescreen which can fix compatible games at the touch of a button. Ryse, Skyrim, The Vanishing of Ethan Carter, Dead Rising 3 and Middle Earth: Shadow of Mordor—all the games I’ve been playing this month—worked more or less perfectly without much fuss at all. Thankfully, Elite: Dangerous just worked without any need to resort to Flawless Widescreen at all. The only real issue then is one of price. Originally I was told the U3477Pqu would be the same price as their 4K panel, but it’s worked out considerably more. That’s a shame, but it is still a beautiful, dramatic panel that trumps 4K for me entirely. If you’re going to spend big money on anything for your PC, make it your monitor. That’s the portal into your gaming rig, and this screen is still going to be making you very happy long after your current GPU has shuffled off its silicon coil.